Puzzle games generally come in two different types. The first is the all-consuming singular addiction, like Doodle Jump or Bejeweled; get addicted to Bejeweled and you need nothing else than the rush of chasing your next high score. The second kind involves the problem-solving high, like in Theseus or Colorbind. Because the satisfaction of untwisting a brain bender doesn’t come with a high replay value, you must constantly seek out new and innovative puzzles for your next puzzle high, so you lovers of this latter type will be delighted by Cross Fingers. Playing a bit like a combination of tangrams and sliding puzzles, Cross Fingers is another twist addition to the puzzle genre. You have a series of oddly cut blocks and a shape you want to make, but you can’t pick up pieces. Instead, you must strategically slide the pieces around, which gets complicated by various barriers and labyrinth-like settings. One particular barrier I came to loathe were the special tethered red blocks. You could move them, but they would always slide back to their original place. This meant you often had to employ multiple fingers and hands to hold all the pieces in place as you slid things about. I think this only bothered me because most of the levels could be completed with one hand and relied solely on brain power, so it was irritating to have to switch gears and get creative with finger placement and speed instead. The difficulty settings didn’t really seem to make any distinction between the relative puzzle difficulty, and the puzzles are fairly easy even on hard, but there are a fairly large number of levels to work through regardless. Cross Fingers tries to simulate a physical block puzzle, and the controls are fairly intuitive, but I didn’t love the interface, largely because it was all too easy to slide a piece into place and then inadvertently knock it out as other pieces were moved around, and movement was not especially smooth. It’s not a huge issue, but it’s definitely obvious enough to be a little annoying. I liked the overall feel of the game, very clean with its solid wooden design scheme, but sound was practically nonexistent. A little music or the option to play your own music is always welcome in these slow-paced relaxation puzzle games, but its a minor detail. Overall, I really liked the concept of Cross Fingers. If they can tweak the control scheme a little, this could easily become a very nice and simple puzzle classic. 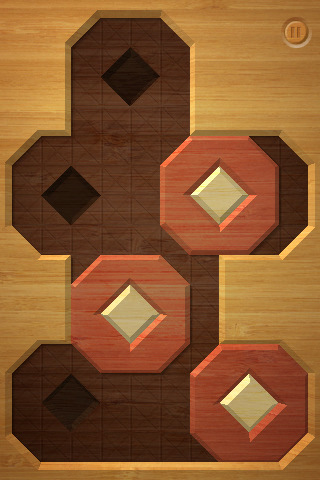 AppSafari review of Cross Fingers was written by Tracy Yonemoto on April 27th, 2010 and categorized under App Store, Board, Games, Puzzler. Page viewed 3974 times, 1 so far today. Need help on using these apps? Please read the Help Page.